MAC Blot Powder provides shine control without adding any noticeable color texture. It also sets foundation and provides a smooth looking finish. Cle de Peau Concealer covers it all from spots to freckles to dark circles. It helps create an even-toned complexion. MAC Bronzing Powder gives you sheer, natural color and highlights. Use the powder to enhance your skin tone or strengthen your tan. YSL Touche Éclat Radiant Touch eliminates shadows and signs of fatigue. You can use this highlighter pen at any time of the day over bare skin or under foundation. MAC Tinted Lip Conditioner (in Soothing Beige) provides SPF 15 protection in a sheer wash of color. With a natural sheen, it conditions lips and locks in moisture. 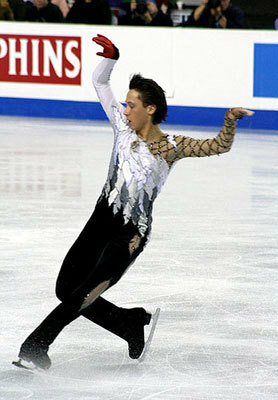 Whether you’re a competitive athlete or just a fan, you can use these products just like Johnny Weir does: to make you look healthy, strong, and ready to step up for any challenge. Welcome to My World by Johnny Weir is out and it sounds like a great read. The book features a collection of anecdotes and essays about pop culture, skating, fashion, and Johnny himself. Basically, it’s an “all things Johnny” book. This is relevant to my interests. Thanks for providing this info! It’s really nice to hear that he is not embarrassed about wearing makeup. Afterall why should’nt he look his best on the ice? !